With much debate over the past decades, about the difficulty that companies in male-dominated sectors claim to have, in attracting female talents for their boards and senior management ranks, MAERSK Lanka recently marked a noteworthy accomplishment in the local shipping arena, by filling 50% of their top management with talented female role models. 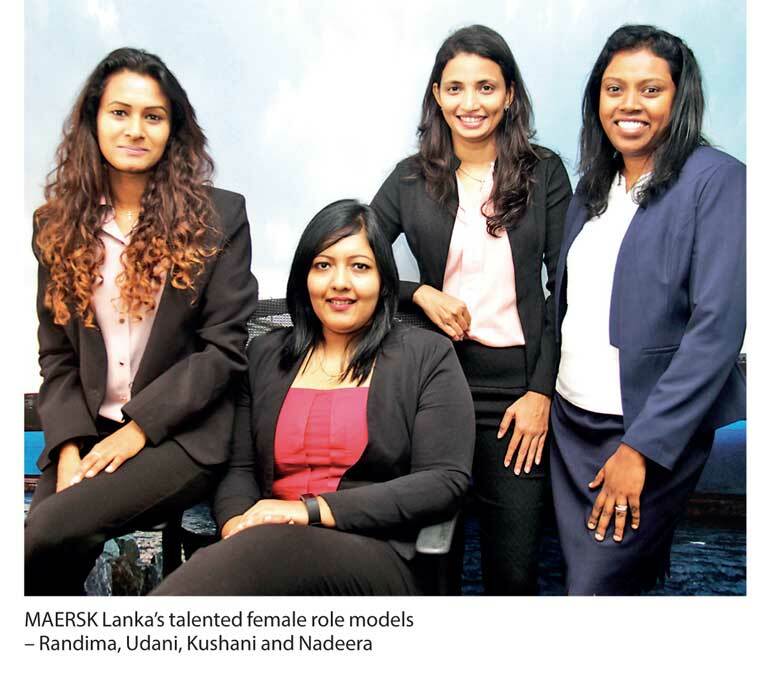 The ladies, Randima Krishnaratne, Udani Warnakula, Kushani Ekanayake and Nadeera Abeykoon joined MAERSK, from diverse industries ranging from FMCG, Banking, HR and Logistics. Randima is the Country Sales Manager for Sri Lanka, responsible for achieving the country’s sales volume, ensuring maximum profitability and managing and guiding the sales team towards optimal performance. Udani, appointed as the Country Manager for Safmarine, will lead the brands initiatives and presence in the Sri Lankan market. Kushani leads the Sri Lanka customer service team to support and drive positive customer experiences across Maersk’s broad spectrum of services. Nadeera, as the Human Resources Business Partner is in charge of workforce planning, recruitment, talent management, leadership development and implementing the Strategic HR initiatives of the organisation. Outlining her leadership style that had orchestrated her success, Randima stated it entailed in making people understand the unique contribution and value that a woman can bring to the table in a company and a boardroom and in being in touch with your capabilities and using it to advocate and negotiate strongly to implement strategies you are confident will work for the organisation. Udani expressed for her it entailed in breaking the cultural norms and expectations about behaviours that are deemed appropriate for women and in being persistent and resilient and not being daunted by challenges that come your way. She affirmed that MAERSK fostered such a culture by nurturing the skills of their employees to achieve their full potential and inspiring gender diversity in all its dimensions. Kushani attributed her participative style of leadership, as her “mantra” for success and giving her team members a voice and the chance to be actively involved in the company’s operation and in making them feel personally liable for its success. All the ladies suggested having more females on boards and senior management positions was important, as studies show that companies who do not have a well-balanced gender workforce and leadership team, underperform in the market in contrast to those companies who have successfully achieved such a balance. Giving their perspective in what they believe are the biggest challenges for women in leadership roles in Sri Lanka, they said the key barrier they saw were the difficulties women encounter in balancing their personal lives with work, which has stood in the way of women getting into higher levels in management. They voiced that local companies therefore should identify and update policies and procedures to support the upward mobility of women. These should combine greater development opportunities to expand the pipeline of women in supervisory and managerial positions. They cited that diversity and inclusion should not be about gender but about attracting talent and that both businesses and government should play an important role in closing the gender gap that currently exists in the workplace.